WICHITA, Kan.— For the past 40 years, visitors at the Sedgwick County Zoo have watched Stephanie the African elephant grow up. She arrived in 1972 as an orphan from Kruger National Park in South Africa and was one of the first animals to come to the zoo after it opened in northwest Wichita. She continues to captivate visitors at the zoo, but she now has a new home with new roommates. Earlier this summer, the Reed Family Elephants of the Zambezi River Valley exhibit opened to the public. It is the third-largest elephant habitat in the country, adding six elephants to accompany Stephanie. The citizens of Sedgwick County and the Sedgwick County Commission funded the $10.6 million project and the new elephants arrived this spring from drought-stricken Swaziland in southern Africa as part of an ongoing rescue mission. Joining Stephanie are a 20-year-old female, her son and four females estimated to be 6 to 8 years old. The elephants’ new home has five acres of outdoor space landscaped with mud wallows, sand mounds, water features, trees and open space for the herd to move around. A south yard includes the world&apos;s largest elephant pool (12-foot-deep with 550,000 gallons) along with two water cannons where zookeepers can give elephant-sized showers. The north area features a waterfall and small wading pool for the elephants. Between the two largest elephant yards is a covered pavilion that allows guests nearly 360-degree views of the elephant habitat and can be used for special events. An 18,000-square-foot indoor facility has capacity for up to nine elephants and has state-of-the-art equipment for medical checks. The barn features a large public viewing area, a keeper kitchen that is viewable by the public and a training wall for the elephants. All but one of the stalls has sand substrate flooring that is beneficial for the animal’s overall health. The entire habitat is designed to provide the pachyderms with choices that help ensure their physical, mental and social well-being. Sedgwick County Zoo officials studied the latest scientific research about elephant welfare, including a landmark 2013 study that assessed the health of elephants at all U.S. accredited zoos and identified opportunities to improve welfare for all elephants in professional care. Since its inception, the Sedgwick County Zoo has developed into one of the country’s top-ranked zoos and the seventh-largest zoo in the United States with nearly 400 different species. 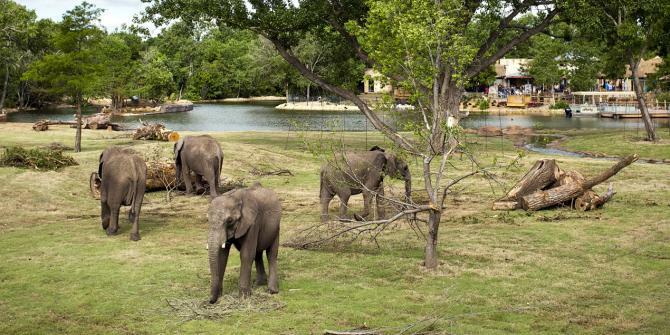 In addition to walking through the zoo, you can also see the new elephant exhibit from the zoo’s free narrated tram tour offered daily year-round or the boat tour that is offered daily throughout the summer. Stephanie is 44 years old and has lived most of her life at the Sedgwick County Zoo. She arrived at the zoo in 1972 as an orphan from Kruger National Park in South Africa. Simunye (pronounced sim-un-ya), is an 18- to 20-year-old female whose name means “we are one,” is the mother of Titan, the only male in the herd. Arusi (pronounced uh-ROO-see) is a 6- to 7-year-old female elephant whose name means “the sun” or “born at the wedding time.” Distinguishing feature: she was born without tusks.